Unless you’ve been living under a really boring rock, you’ll know that the very excellent, very simple and very F-U-N #LGF10aDay Challenge kicked off last week. The concept is pretty simple – 10 minutes a day, every day, throughout December. It’s your (completely free) ticket to a healthy silly season. I’ve put together a workout for every day of the month (yep, including Christmas Day). All bodyweight exercises, all simple enough to do in your own home or backyard. You may notice that days 13 to 16 feature my all-time favourite exercise… that’s the burpee (obviously). I’ve included a few variations, so if you need a refresher, check out this post I did a while back, complete with videos. If you don’t recognise an exercise, check my pictorial exercise index here or use the search function on my blog. If you still can’t find it, make friends with YouTube. All exercises are relatively simple; you shouldn’t have much trouble finding them. Keep up with the Challenge on Facebook, Instagram, Twitter and Pinterest. 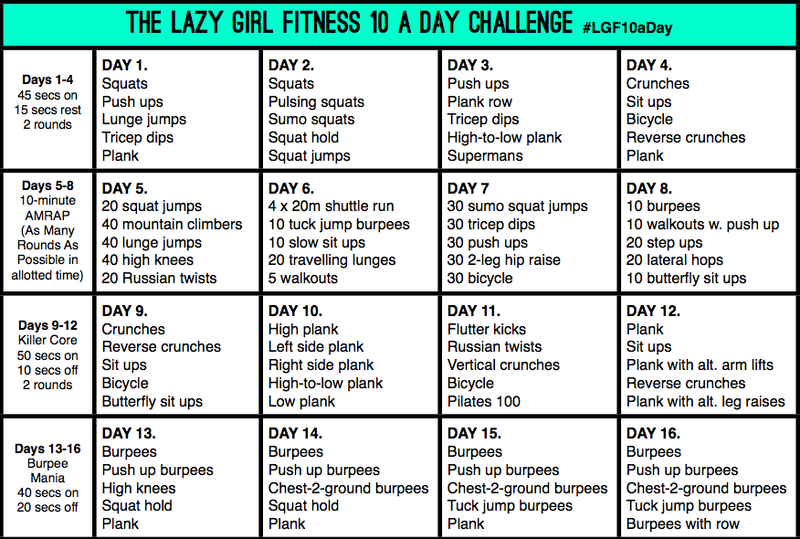 And show me your workouts/progress using the hashtag #LGF10aDay. I’m playing along too, and I’m loving sharing the good times with you!